Our Guitar 🎸 Recital and our Talent Show. Our scholars and our teachers did an amazing Job! Tickets Order Forms and Costume Information Coming Soon!!!!! The Fine Arts Department of North Metro Academy of Performing Arts offers theatre, dance, guitar and general music for grades K-5. Classes are taught by community professionals who are experts in their artistic field. Each discipline has a performance to measure the standards that are being taught. Our Fine Arts Series includes grade level performances K-2, that will showcase our NMAPA scholar’s ability to sing on pitch, dance in rhythm, memorize lines and develop characterization. In our music program, third grade scholars develop beginning instrumentation skills and sight reading on the recorders. 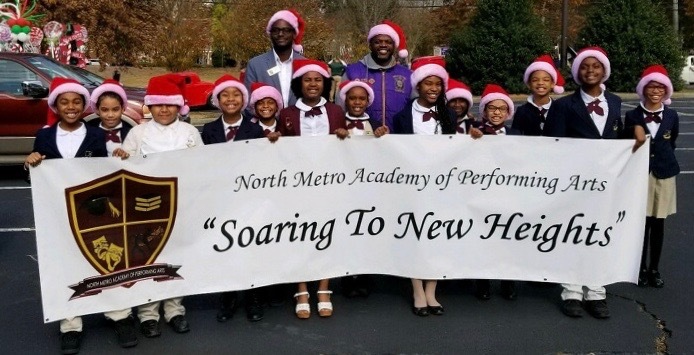 At North Metro Academy, our Elementary scholars are given the elite opportunity to audition and participate in our “Majors” program, whereas they are specifically trained three days a week for a specific discipline in the arts and perform during the school year with a stellar aptitude of mastery in guitar, dance, art or theatre. Our creative Art Majors assist with set design and props for all productions. All fourth and fifth graders additionally receive a required music class that covers the building blocks of music theory, vocalization and instrumentation to better prepare them for a middle school music program. November 12th, 2018 4:15-6 p.m.
As part of our programming for this year at NMAPA, we will audition scholars to represent the school in community, television and public appearances. These scholars are known as the NMAPA players and they are triple threats in acting, dance and singing. 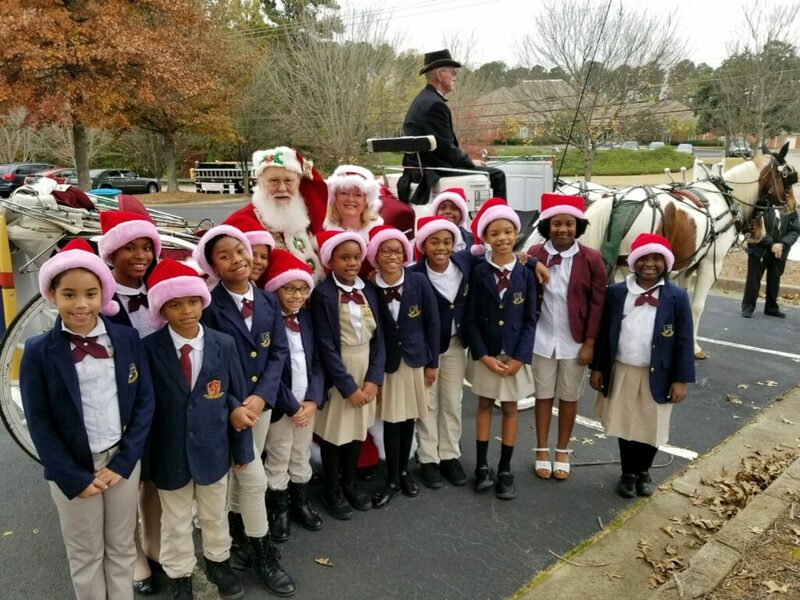 Last school year, NMAPA players has the pleasure of performing for the Peachtree Corner’s Annual Parade, The MLK Parade in Lawrenceville, GA and on the steps of the state Capital. This summer they also performed at the Norcross June-tenth celebration! At NMAPA, since our inception, we have showcased our scholars through our yearly main stage performances. In our repertoire, three original productions have been written by our very own staff members — Class Act (Nyasa Sullivan), Broadway! A Music Revue (Shar-Reese Alfred) and Carousel (Herbert Bowens) and two Broadway Jr. MTI shows, Lion King Jr. and School House Rock Jr. performed at the Infinite Energy Center. As a result of our main stage performances our scholars been featured on CBS46 and in Atlanta Parent Magazine. Last year, approximately eighty-five of our scholars performed “OZ” an adaptation based on the Wizard of Oz. Instructed by Theatre Director Shar-Reese Alfred, the drama classes at NMAPA are designed to teach scholars K-5 the foundations of acting and improvisation through theatre games, reader’s theatre and short scene development. In strict alignment with the Georgia Standards for Performing Arts, students are taught understand and create roles in theatre through playwriting and scene study. Additionally, all scholars learn method acting, on-camera acting and audition technique to better prepare for industry opportunities. Fourth and Fifth grade Theatre Majors will audition in class and perform “Twelve Angry Pigs” as their final performance in the at the black-box theatre, “Barefoot Playhouse”, just 15 minutes away from NMAPA. Scholars K-3 will also have grade-level performances to showcase their acting skills on the campus of NMAPA. In this comical yet surprisingly educational parody of “Twelve Angry Men,” a certain wolf is on trial for blowing down a pair of houses owned by the Three Little Pigs. A Jury of Swine must now decide if they will oink in favor of conviction, or declare the wolf not guilty. Throughout the deliberation, most of the angry pigs believe the wolf is big and bad. However, an ensemble of storybook characters helps the pigs review the testimony, and Pig #8 asks some tough questions. Questions that will make the rest of the pigs realize that the witness testimony of Little Boy Blue is nothing but hogwash! The art form of Dance is instructed by Choreographer and Director, Nyasa Sullivan. In dance scholars are taught to use the art of choreography to explore different academic skills through movement, both structured and creative. In compliance with Georgia Standards, scholars are taught to look at dance as an art form and to begin developing an appreciation for different dance forms. In grades K-5, NMAPA scholars are introduced to dance based on movement activities that they have not had the opportunity to explore such as Waltz, Line Dance, Tap, Classical Ballet, Jazz, Theatrical Jazz, and Modern Dance forms. 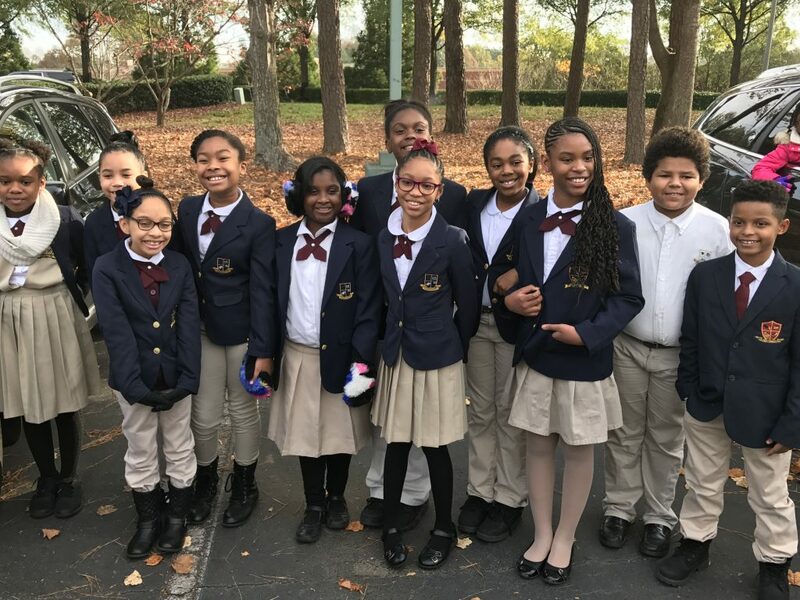 Fourth and Fifth grade scholars that have auditioned and an expressed interest in dance become dance majors and are taught more extensive skills that will allow them the opportunity to pursue further professional prospects that will enhance their personal development and appreciation of the art form. Visual arts, taught by Dorine Perry exposes the scholars at NMAPA to the artistic disciplines of drawing, painting and various arts forms integrating the academics of science, math, history and literature into various art projects. Students in K-5 are learning skills to conceptualize and organize their art. This year at NMAPA Fourth and Fifth graders are able to chose Art as a major in which they learn deeper concepts of designing props, set and costume for all theatrical productions. Previously, artistic work from our scholars has been on display at the Norcross Public Library and featured in the Norcross Art Splash. Music has a unique place in the school curriculum. While it is an academic class, in the sense of having a definite curriculum and expected competencies, music carries itself into the world outside of a school day. Music is all around us and often we hear it on the radio, the television, and even in the modern world of the I-Pod. It is my job as a teacher to instill into each student an enriching eclectic musical experience. It would include Mozart, Beethoven, Benny Goodman, Motown, Taylor Swift, World Percussion, and the list can go on and on. It is the job of a music teacher to fill the minds of a student with the many different sounds that culminate into the universal language of music. The NMAPA of Arts Programs offers Music For Mozart for K-2, Recorders for 3rd and 4th Grade, and Piano Class for 4th and 5th Grade. Music and Guitar classes at NMAPA are a key component of the schools vision, mission, and uniqueness. The customized curriculum not only follows the Georgia State Standards, it surpasses it. Starting in Kindergarten and with each passing year we build a culture of discipline, appreciation and proficiency. In our weekly classes students weave music lessons with their academics. The skills taught and used in music can be directly applied to all parts of their day. Classes are kept fun, informative, and engaging. Learning music offers social interaction, creative expression, and an understanding of where we came from. Most importantly, the students are taught how to tackle a goal with purpose and structure to maximize results and achievement. Many Guitar and Music students will have performance opportunities throughout the year. I look at live performances as not only a time to showcase what they have accomplished but as another learning opportunity that teaches teamwork, goal setting, and real world application. This class provides opportunity for students to develop their musical potential and aesthetic understanding for music. This year Chorus/Music Technology is part of NMAPA’s Aftercare program. As we integrate academics with singing, we also teach them using the computer for music games . Each student will learn how to develop skills and performance techniques by singing alone and with others, a varied repertoire of music for enjoyment and appreciation. NMAPA is fortunate to have instructing this class Mr. Dennis Byrd, an accomplished musician, recording artist/producer, vocal coach, award-winning composer and audio/video forensic specialist. Mr. Byrd composed our school Alma Mater and continues to write special music for our students and our performances.